U.S. President Donald Trump has chosen Pacific Command chief Adm. Harry Harris — known for his strident views on China’s military expansion and nuclear-armed North Korea — to be the United States’ next ambassador to Australia. The White House announced the move in a statement Friday, calling Harris “a highly decorated, combat proven Naval officer with extensive knowledge, leadership and geo-political expertise in the Indo-Pacific region” and 39 years of experience in the U.S. Navy. Harris, who was the first Asian-American to achieve the rank of admiral in the U.S. Navy, could play a key role in promoting the Trump administration’s strategy for “a free and open Indo-Pacific region” and ensuring a rules-based regional order in partnership with Japan, India and Australia. Currently in the final year of his three-year tour as head of Pacific Command, Harris is due to retire soon. He has been known as an outspoken backer of a strong response to China’s aggressive moves in the East and South China seas, coining the term “Great Wall of Sand” to describe Beijing’s strategy of building up and militarizing disputed features in the South China Sea. He has echoed Trump’s “maximum pressure” strategy for dealing with Pyongyang, saying in November that military-backed diplomacy is needed to deal with North Korea. Appointing Harris as envoy to Australia will be seen as reassuring a key ally and strengthening the administration’s Asia team, which remains full of vacancies more than a year into Trump’s first term. The admiral is known to have strong ties with military and political leaders in the country, having visited several times as head of Pacific Command. Media reports have painted the Australian government as growing more and more concerned over the 16-month failure to appoint an ambassador after the previous U.S. envoy, John Berry, left the post in September 2016. Although the job has been filled by Charge d’Affaires James Carouso, it is highly unusual for such a key post to remain empty for so long. Australian Prime Minister Malcolm Turnbull expressed his approval of the pick in a tweet Saturday. “Great to see Admiral Harry Harris nominated by @realDonaldTrump as US Ambassador to Australia. Look forward to seeing you in Canberra, Harry!” Turnbull wrote. Harris’ nomination will now go before the Senate, where he is expected to be confirmed. But his nomination is likely to face criticism from China, of which Harris has been an outspoken critic. 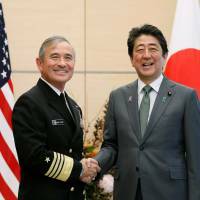 Last April, he spoke glowingly before U.S. lawmakers of the four-way cooperation tie-up between Japan, Australia, India and the United States known as “the quad” as a means of bolstering ties in the Indo-Pacific region and reining in Chinese assertiveness. 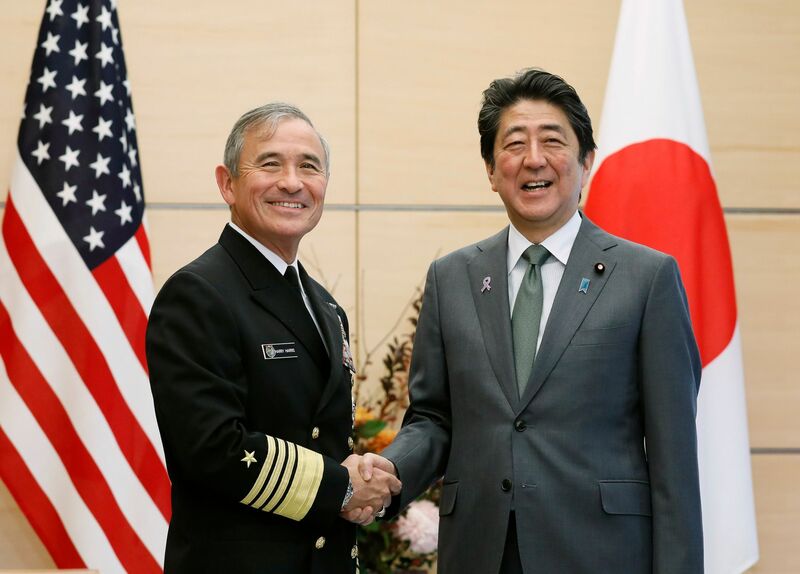 “I think there’s a naturally forming democracy-centric multilateral, quadrilateral relationship between Japan, the United States, Australia and India,” he told the House Armed Services Committee at the time. In May, Kyodo News reported that Beijing had urged Washington to fire Harris in return for boosted pressure on nuclear-armed North Korea, citing an anonymous source. Harris, who is half-Japanese and was born in Yokosuka, Kanagawa Prefecture, but was raised in the United States, has long been a subject of interest for China. Beyond his Great Wall of Sand speech in March 2015, in which he denounced Beijing’s massive land-reclamation projects in the South China Sea, his heritage has also made him an attractive target for a Chinese leadership that routinely blasts Japan over an alleged lack of atonement for its brutal wartime past — often as a means of whipping up nationalist sentiment. Alleged moves by the Chinese government in Australia have also stoked controversy in recent months. Lawmakers there were given a report late last month detailing Beijing’s alleged use of a sophisticated network of supposedly nonpolitical organizations that suppresses criticism, cultivates relationships and exerts influence over the country’s business, academic and political worlds. Experts said Harris’ nomination could convey to Beijing that Washington will not sit by as China attempts to diminish U.S. alliances in the Asia-Pacific region. “I think it sends a strong message to Beijing. The Americans are concerned about Chinese influence campaigns in Asia, and Australia is one of the key places where China is seeking to sow division between the U.S. and its allies,” said Malcolm Davis, a senior defense analyst at the Australian Strategic Policy Institute.